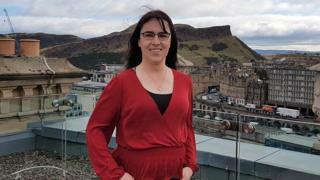 “I knew from a young age that I wasn’t the same as the other children,” says Sophie Roberts, a 34-year-old Amazon software manager based in Edinburgh. It was 20 years later that she took the decision to come out at work. Last month, after two years at Amazon, she started coming into the office as Sophie. She admits she was nervous that her transition would affect her professionally – the tech sector isn’t exactly renowned for its diverse workforce. But her experience at Amazon may have lessons for other companies big and small. “I did go into it thinking to myself, ‘Is this going to be a problem? '” she told the BBC. However, for Sophie, the experience so far has been overwhelmingly positive. After beginning discussions with her site leader and the local human resources team in January 2017, Sophie made her initial announcement by email to 1,000 colleagues in May this year. She says her colleagues were “surprised, supportive, excited” – and one particular response has stayed with her. Amazon doesn’t have the best reputation for employee relations, with claims that warehouse staff have been treated like robots and software engineers have been expected to work “extreme hours”. But Sophie credits the company with being a supportive employer. “Organisations want to help with this,” she says. The tech giant already had a toolkit in place, designed to answer common questions that staff may have – including an explanation of its bathroom policy (staff can use whichever gender bathroom they identify with) – to take the burden off people like Sophie having to explain the same things over and over again. Sophie worked with Amazon in the US, and the firm’s LGBT group Glamazon, to adapt the toolkit for the UK. Glamazon also successfully suggested a change to the internal staff directory, and as a result all individuals can now display the pronoun to which they would like to be referred. “That was probably the first major thing that I think brought the conversation really into people’s minds,” she says. While Sophie had a good experience within a large organisation, this is not always the case, says Dr Jane Hamlin, president of the Beaumont Society, a UK-based support group for transgender people. “The problems that we hear about tend to be with middle management and work colleagues,” she says. “Banter and jokes that are not funny for the trans person involved. There can also be issues when changing jobs, Dr Hamlin says, citing an example of a trans woman currently seeking advice because she has applied for a new job and has been asked to supply a birth certificate. “A trans person can only get a new birth certificate if they have a gender recognition certificate,” she says. For Sophie, after many months of physical changes, and a name change, her return from a holiday in October seemed like the natural time to come to work as Sophie for the first time. “I announced in May and I only started presenting as Sophie in October and then we had a lot more conversations which I think was the point where it became a lot more real for people,” she says. “In terms of my colleagues talking to me, I asked them to talk to me as they would talk to any other colleague. “Don’t be scared of asking me a question because I am transgender, but also don’t wade into questions that you wouldn’t ask any other colleague.